New Help-U-Sell brokers sometimes stew way too much about their DBA. They want to come up with the perfect name, the one that expresses who they are; the one that will kick their marketing effectiveness up another notch. Is Help-U-Sell Superior Homes better than Help-U-Sell Apex Properties? Truth is: the consumer could not care less. An ordinary broker, running an ordinary agent-oriented office, is building . . . very little, really. His business is driven by the personalities of his agents and the relationships they develop. There is no unique consumer offering that draws people to the company. In 2013, very few people call ABC Realty and say, ‘Hey, ABC, come list my house.’ No. They call up Sally who happens to work at ABC and say, ‘Hey, Sally, come list my house.’ And you know what? When Sally goes down the street to go to work for XYZ, they’ll call her there too. So when that ordinary broker decides it’s time to cash in and move on, when he attempts to employ his Exit Strategy, he finds he has little to sell. The value of his company is a gamble at best. All a buyer gets is the chance to keep the agents who have done the business and the chance to keep the listings and clientele they have amassed. And it’s a fair bet that at least some of those agents will not like the change and take the opportunity to move on down the line. It’s so different at Help-U-Sell. We have a business model and a consumer offering that people seek out. Every day, people call Help-U-Sell and say, ‘Come list my house.’ When the Help-U-Sell broker decides it’s time to move on, he has a business to sell that can continue to function after he is gone. The buyer is getting an established enterprise and the transition from one owner to the other will likely be invisible to the consumer. The DBA becomes irrelevant: it’s Help-U-Sell that matters. That’s absolutely true. But most people are also interested in saving money and they will often investigate their alternatives before even working with a pal. That’s when they discover that we’re people too! Yup, underneath the neat system that gets results and saves money is a group of really good, competent, likable people. That’s why so many of our established brokers enjoy great repeat and referral business. Oh, the savings remains a driving factor, but it’s the personal relationship that turns satisfied customers into raving fans and keeps them coming back again and again. I’m not seriously suggesting this, but I really don’t think it would make one whit of difference if you chose ‘Umm’ as your DBA: Help-U-Sell Umm Realty. Or maybe Help-U-Sell Acme, Ace or ABBA. What matters is that first part, the part that consumers recognize as leading to savings. Dear Mr. Feder. Thanks for writing and, believe me, you are not alone. I am considering starting a 12 step program for Ordinary Brokers and I’m sure the meetings would fill fast. But first, let’s understand that the kind of change you’re talking about is HUGE. It’s not just a simple matter of altering how you charge consumers or how you offer your menu of services. Even a well-studied outsider would probably screw it up without expert coaching. Start carefully monitoring the lead flow in your office. Where are the leads coming from? What (and who) is generating them? What portion of the incoming leads are coming from company sources as opposed to agent sources? You want to consider this to know how much business your company is likely to do in the event all of your agents pack up and leave; which is a possibility if you go through with the change. By the way, ‘carefully monitoring the lead flow’ means to monitor it like it’s never been monitored before. You want to get source information on every single inquiry, whether contact information is gotten or not. You want to know why everyone, even the caller who was a nutcase or the one who simply hung up, called your office. I don’t think you can realistically expect your current staff, and certainly not your current agents to do this. My suggestion: hire someone (or convert your best office admin) to handle ALL phone and Internet inquiries. One person through whom all incoming traffic is routed. This person collects source information, handles the inquiry, collects contact information and then turns the lead over to you for assignment to the appropriate agent. By the way, if yours is a big office, you probably need more than one person doing this important function. Try to maintain your sense of humor as you review the data your new call coordinators are collecting. You’ll probably discover that many of your agents, in fact, most of them, have been living off leads YOU generated. You’ve been paying them huge splits to generate their own leads, do their own marketing and so on . . . but it has been YOUR marketing, your investment in signs, facilities, web presence, and advertising that has been causing consumers to contact the office. Surprise, surprise! It’s time to wake up now. As an aside, I once did a modified version of this exercise with an Ordinary broker who had a ‘Top Producer’ who did about 30% of the office’s production. The broker spent most of his days living in fear that the agent would leave. When we did the analysis we discovered that more than half of that agent’s production came from office-generated leads. Then we put a pencil to the company dollar she generated (after the huge split she was paid), deducted a factor for what it cost to produce those company-generated leads and discovered that the broker was probably losing money every time TP closed a deal! He was making more from some of his less productive people. He said goodbye to TP then watched as everybody became more productive and his bottom-line improved. Start calculating what it actually costs you to market a properly priced listing. Don’t consider what you have to pay a listing agent. We’re only looking at hard costs here: how much marketing, how many days of office operation and so on. Be aware that whatever number you get today may be different tomorrow. Cost to market a listing varies in direct proportion to days on market. If your marketplace slows and DOM goes up, so will your cost to market a listing . . . so take your figure and add a ‘fudge’ factor – say 25%. Now consider: is there a way to effectively accomplish the successful marketing of a listing without paying an agent 70% or more? This involves carefully examining what a listing agent actually does. We could go through the whole laundry list here and then we could demonstrate how almost all of it could be done much less expensively . . . but instead, let’s just acknowledge a fact you already know to be true in you gut: You’re paying that agent 70% NOT to sell the listing, but to GET the listing. It’s the damndest thing! Today, we pay listing agents at closing not for getting the listing sold – listings, properly priced and plugged into an effective marketing program pretty much sell themselves – but instead as a reward for bringing business into the company. In other words: for getting the listing. Now your task is becoming clear. You must create marketing and administrative systems for standardizing the marketing of your inventory. You have to take marketing BACK from your agents. You need to design it, orchestrate it, hire the admin staff to get it done. Marketing has to transition from being idiosyncratic – created willy-nilly but a pack of individual agents who have widely different ideas about marketing – to being automatic . . . standardized, monitored, controlled and adjusted by you. In your new universe you’ll be plugging your listings into your already operating marketing system, not designing a whole new marketing program for every listing you take. Its a very big shift. Then you have to take BACK the ‘getting’ of listings from your agents. You and your team of assistants now need to be in charge of this inventory procurement function. I am aware that the faint of heart, having read this far, are now shutting down their computers. Oppressed by their own paradigms, they cannot envision a world in which listing inventory is secured without agents. But I assure you it can be. It starts with an examination of your seller offer: what do you have to offer that is, far and away, better and different than most of your competitors. If – like most real estate brokers – your offer is identical to every other broker’s, you have a problem. You’re going to have to refine who you are and what you have to offer until you stand out from the crowd and are thus, easy to spot by consumers. Then you must market that offer. If you take out all of the fluff and show-biz most listing agents trot out during their presentations, this can be accomplished in, oh, 30 minutes of less. When you have a better deal to present, you don’t need the smoke and mirrors, the fluff and show-biz to get the listing. Up until now, most of this could be done in stealth mode. You could do your research and preparation without telling your agents. But now that all the ducks are in a row, everything is lined up and ready to go, it’s time to call a special meeting. Present the state of the company – get right down to profitability. I don’t know what yours is, but if you’re like most Ordinary brokers your company is making less than 5% profit – which is obscene considering the risk owning a real estate company involves. Get their buy-in that that’s a pitiful bottom line for a fine real estate company like yours. Then present your solution: you are going to become a lead generating machine, which means taking back marketing and investing in it heavily. They will like that. But, you’re also going to take back the listing function. You will no longer need agents to find consumers – you’ll be doing that with marketing. What you will need agents for is handling the buyer leads your marketing and your listings generate. You anticipate that a good buyers agent in this new company you are building should close in the neighborhood of 20 transactions this year – all basically fed to them by the company marketing program. You may now invite all who are not interested in this opportunity (which will be most) to leave. Now, interview the ones who are left. Since you will be shouldering the financial burden for lead generation, who on your remaining staff would you trust with the important task of converting them to sales – for a much more reasonable 50% split. At the end of the day, your office population may have dropped from, oh, 50 agents and 3 admins/assistants to 5 agents and 4 admins/assistants. You can now begin to look for smaller, less expensive space. By the way, all through this process, it’s a good idea to contact Ron McCoy at Help-U-Sell for advice and to begin a conversation about becoming part of the family. The Brand will help you through the transition and position you properly for maximum impact in your marketplace. As you start to walk down this new path, you will begin to feel as if you are waking up from a very long nap. Real estate will look new and it will be exciting again. You will be filled, even driven by a new sense of purpose: the mission. You’ll work harder and have more fun than you have in years. And, in six to nine months, your personal bottom line should be way ahead of where it is today. One of the hardest things self-employed people must do is to hold themselves accountable. We’d all like to believe we’re ‘self-starters,’ but the truth is: that’s a rare individual. You, as an entrepreneur and business owner, may even have difficulty at times getting yourself to do the things you know you need to do. That’s why coaching can be so effective. Just knowing you’re going to have to report to someone else provides enough push to get most of us in motion. Minimum standard of production for buyer agents: 6 closed sides in the previous 3 months (That’s 2 per month and really, if they can’t do that, they’re probably costing you too much in fumbled leads and lost business). New agents get the first 3 months to ramp up, so we begin to hold them accountable at the end of their 6th month, for months 4, 5 and 6. It’s a rolling 3 months, so each month we add a month and drop off the oldest month. We do the three month look-back at the end of each month, and the first period in which they fall below 6, they are reminded of their commitment and offered increased coaching. Two months in a row and they must commit to a remedial program designed by the broker (design should be easy: I’d simply go back to Science to Sales). Three months in a row and they are de-hired. Using the three month look-back allows for the peaks and valleys that are typical of a productive agent’s career and considers production over a longer period. If they fall below the line three months in a row, that’s a pretty good indication of their capability. Expectations and minimum standards are a good start toward accountability, but there’s more to it than that. Saying we expect a number of closed sides is great but you can’t manage ‘closed sides.’ You can’t make them happen. They are an event, not an activity You manage activities — the activities that lead to closed sides. So part of your office culture should be an activity planning/commitment and accountability process. Each buyer agent should commit to a certain number of activities every day and then report what they actually did. This way, if they fall below the production expectation, we have something to go back to that might show us why. 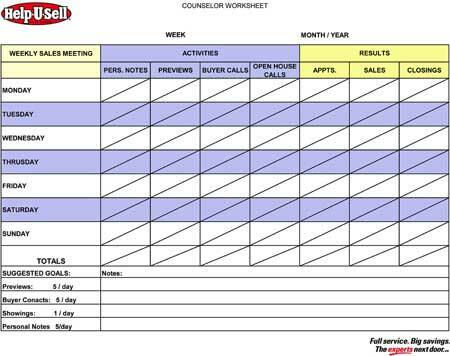 Here’s a picture of the activity tracking sheet John Powell uses with each of his buyer agents. And here’s a summary sheet he uses for an at-a-glance assessment of his entire sales team. Both of these are available in the Download Library under ‘National Sales Meeting,’ ‘July 28, 2010’. They are called ‘Tracking Sheets.’ You’ll note that each agent commits to a certain number of activities and then reports how many they actually did. As broker/owner of a marketing oriented company, you also want to keep careful track of how each of your buyer agents are doing with leads. In a perfect world, your admin answers every call and routes buyer leads to your team of buyer agents. It’s the admin who logs the call and gives you a basis to go back to your agents and ask, ‘what happened to this one?’ and ‘did you do a Buyer Data Sheet on this one?’ The metrics you want to track are: How many leads each agent received, how many resulted in a complete Buyer Data Sheet with contact information, how many Buyer Data Sheets resulted in appointments, and how many appointments resulted in sales. This information becomes a management tool. It will help you spot the one who needs more work on taking control of incoming calls and completing Buyer Data Sheets. It will help you spot the one who can gather information but can’t seem to get an appointment. It will also help you spot the one who works lots of leads but only closes a few. It’s all about identifying areas for improvement and then working on them. So, you get your entire office functioning in a culture of clear expectations, firm commitments and accountability . . . all’s right with the world, true? Maybe. But what about you? Who’s holding you accountable? Just like the best agent you’ve ever had, you at least need someone to run your ideas by, someone to remind you what you said you wanted to accomplish and get you back on track. You could pay a coach — there are dozens out there and many swear by the results they get. But I think you would be better served by staying in-house and getting involved in a structured coaching program at Help-U-Sell. John, Ron McCoy, Jack Bailey and I are here and would welcome the opportunity to help you plot and scheme. All it takes is a call . . .
And now, for Step 7! Help-U-Sell is a broker-centric business model, which is to say: the broker is in control of the business. He/she takes responsibility for studying the market, designing and implementing the marketing, generating the leads, converting them to listings and sales and ensuring the survival and growth of his company. That does not imply that there is no place in a Help-U-Sell office for agents. True, if you look at the issues that plague traditional real estate offices, you can easily conclude that the agents are the problem. Their huge commission splits, constant shopping for a better deal and complacent acceptance of sub-standard productivity have all but destroyed any chance for a traditional broker to make a reasonable profit. But truth is: that’s not a problem with the agents, it’s a problem with the broker. The issue isn’t agents. It’s broker control. The broker stays primarily responsible for the listing function. That means he takes the listings or has an assistant stand in for him. Agents flourish in this environment. They come to work every day with something to do, confident that there will be another buyer and another buyer to keep them busy because the broker is marketing and the marketing works. Sellers receive maximum exposure because the office has a well thought out marketing program in place, controlled by the broker, not a bunch of individual agents. Buyers get to work with specialists who aren’t distracted by the listings that aren’t selling or the ad that’s due today or anything else that goes on in the other side of the office. The Broker smiles every month when he sees his bottom line. His business makes sense because he stayed in control.